My purpose in starting Next Phase in Fitness seven years ago was to record my fitness training and events. I’ve now decided to change the focus of the blog slightly. I will still be recording my training and events, but now that I’m ageing I’m not participating in as many events. I’m still training and very much love working out in my home gym, so will still be recording that here. The plan now, is to also focus on ‘fitness for seniors’ as it’s a topic that I’ve become more interested in as I age. I feel that I have much to contribute to discussion in this area. Being active as we age, in my opinion, is more important than ever. Many of us start to slow down in our working life, and think about retirement which is great. But it’s really important to keep moving. Activity will help with enjoyment of ageing and a general feeling of well being and contenment increases as fitness increases. Increasing activity can also help retirees to stay independant for longer which is a great reason to keep moving. The question that has been on my mind lately is – ‘what stops you exercising?’ Non exercisers are especially on my mind as I wonder why everyone in the world hasn’t fallen in love with fitness and training. To me the feeling after completing a training session can’t be beaten. I love that feeling and I would love others, especially seniors to experience it. In thinking about what some of those barriers could be, there are some that I’m sure are relevant to both younger and older people. I can also think of barriers that might be appropriate to mainly older people. My l advice would to always see a doctor first, if you’re taking up an exercise program, especially for the first time. It’s definitely possible to work around injuries. Your doctor will give you advice about which type of exercises you should avoid or modify so as not to aggravate any injuries. Just as an example, I have a chronic knee injury and have been advised by a sports physio that I should never do squats or lunges. At first, I was really unhappy about that news, as squats and lunges were prominent in my exercise program. I’ve now substituted other exercises and am confident that on leg days, my workout targets the legs equally as much as when squats and lunges were included. 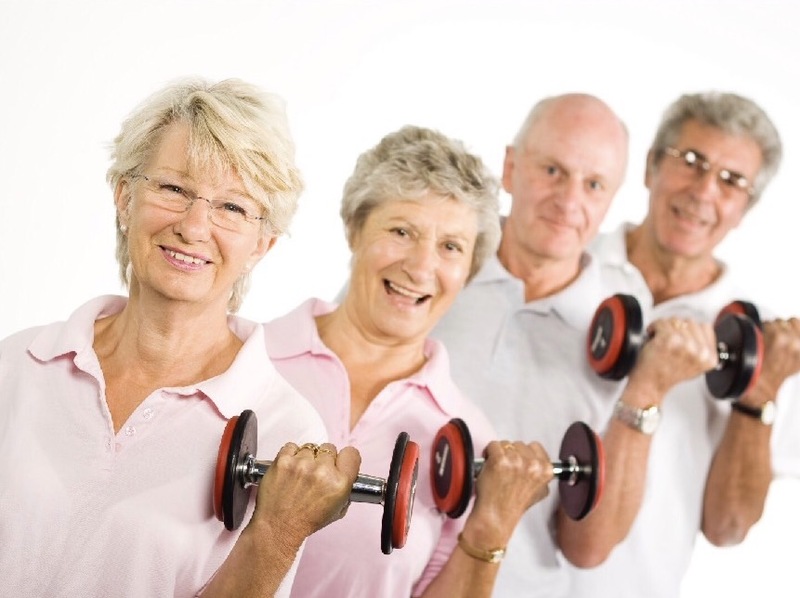 I’m sure that a person in their senior years who hadn’t exercised in their younger years would be very confused about where to start and what type of exercise program would be good for them. I would always suggest to start with walking. Don’t go for long distances at first. If 15 minutes feels enough for you, then that is fine. You can work on building up gradually from there. Perhaps you would also like to incorporate a weights program. This is a great idea as lifting weights is hugely beneficial to older adults. It can reduce symptoms of arthritis, back pain, obesity, osteoporosis ad depression. I’m sure there are many other benefits of exercising in our senior years that I haven’t thought of yet. Weights lifted don’t need to be heavy, in fact, doing more repetitions of very light weights is an excellent place to start. If you’re not sure of what type of weight lifting exercises to do, there are many programs for seniors online, or you could book a single appointment with a personal trainer who could write a program for you and show you how the exercises are done correctly. I really think this is a great investment in your health. The trainer could also help you with planning a program to work around any injuries. My best advice about where to start would be to find something you enjoy. This is one of the most effective ways to be sure of consistency. It is not necessary to join a gym! I’ve been a member of a gym since I turned 30 until recently when I set up my home gym. I realise not everyone can have a purpose built home gym. All you really need is a set of light weights to get started with a weights program. You don’t have to go out and buy weights, as two cans of soup are a good replacement. Many exercises rely on body weight without weights being required. The link above demonstrates this. Don’t be fooled by the advertising you see – no special clothing is required. Just dress in loose clothing and you will be fine. If you decide that cycling is your preferred type of exercise, a cycling jersey could be more comfortable but is not necessary. This is something that I experience from time to time, so I know how difficult it can be to ignore. But it’s best to do just that. Explain why you have decided to get active, but be confident in your choice for a healthy lifestyle. Hopefully, family and friends will start to see you shining with confidence and health and change their attitude towards your choice of a healthy lifestyle. I’m very pig headed with my lifestyle choices and no longer feel the need to justify the time I spend in the gym or exercising in general. People around me now know me as a regular exerciser and mostly there is no longer any judgement. Planning is needed when starting an exercise program, if it is to become a long term reality in your life. It’s so easy for other things to pop up and take up your time. Schedule exercise in your diary and stick to it. I do this every Sunday night. I make appointments with myself, marking them out in the diary, for the next week. This makes regular exercise another thing that is on the ‘to do’ list for the day. Soon it will become a habit, and will be much easier to accept as a regular part of your day. Think of it like brushing your teeth. That is something you do every day, and don’t give thought to. Exercise can become that natural after a period of settling in time. Finding an exercise buddy could also be a great way to make sure sessions aren’t missed. There’s nothing like knowing a buddy is waiting at the corner for you to go walking, to get you out the door. Setting goals is another way to keep the enthusiasm up. Just set small weekly or monthly goals and revisit them to check on your progress. Finally I want to say that I’m not wanting to make anyone wrong for choosing not to exercise. I realise there are many reasons and barriers that can get in the way. But I hope that reading the barriers to exercising helps to make it clearer that adding an exercise program into your day is a very beneficial thing to do for your health in your senior years. I’d love to hear your thoughts. What stops you from exercising? If you are already active, do you know what stops some of your friends from being active? An interesting post Jen. I’ve always loved exercising and the buzz you feel afterwards but for the last couple of years I’ve ground to a halt. So I’d add grief/depression to your list. Intellectually, I know it’d make me feel better but grief seems to have stopped me in my tracks and I feel too exhausted from it to get back to exercising. I’m working on it, walking the dog etc but that switch has yet to click back on…wishing it to happen hasn’t worked. However, I’m sure your posts will continue to chip away at this and inspire me. Love your article Jen, i find determination & be committed to your self gets me through. As I’ve gotten older yes i do get tired waking up early to go to the gym. But now its such i habit i just do it. You listen to your body and you know what days you can really push yourself & the dsys you take it easier. Thanks for your comments Tina. I think we have a similar attitude to exercise. JFDI! This is really good information Jen, I love daily walk/runs but I’ve been thinking that I need to add weights in and other exercises too. I also cycle but nothing terribly difficult. I’ve saved the link you included and will give it a go, so thanks for that. I enjoy my walks and usually it’s not a problem to get up to 30 minutes of exercise each day, I know I have to do it so I just go!! Pleased to hear the info is usefu to you Deb. It’s not always easy to climb out of bed early to exercise. I well know. I’ve exercised regularly for the past couple of decades. I’ve mixed it up several times over the years to prevent the boredom that sometimes settles in. The things that sometimes trip me up are traveling or minor injury or illness. I do think your blog focus of physical fitness for seniors is much needed. Keep up the good work! Thanks Christie. I find travelling a problem at times also. Hi, Jennifer – I like your focus on fitness for seniors. I look forward to following more of these posts. I think that another barrier to fitness can be letting other distractions get in the way. (e.g. technology, blogging, reading, etc, etc.). We may tell ourselves that we’ll go to the gym, or for that walk, after we finish X, Y Z…and then we get further distracted and put it off once more. Another barrier, can be letting bad weather get the best of us. Our walking group rapidly diminishes in numbers during the Winter, especially the rainy season. Thanks for mentioning this barrier Donna. I tend to get distracted easily which is why I get into the gym early before the day starts. Winter definitely makes it difficult and tests out the motivation. Pleased you enjoyed the post. I used to be able to claim the TRAVELING barrier, we were full-time rvers, traveling the country. Now we are only part-timers (winter travel to the south) and I have to say DISTRACTIONS is my biggest barrier. I REALLY need to get better at this….